“I learned that you can fail at what you don’t love, so you might as well do what you love.” To prepare for his role as legendary comedian Andy Kaufman in the 1999 film Man on the Moon, Jim Carrey went well beyond method acting and morphed into Kaufman to a disturbing degree on and off the set. Directed by Chris Smith (American Movie), Jim & Andy: The Great Beyond offers a behind-the-scenes look at the making of Man on the Moon, as well as contemporary interviews with Carrey. 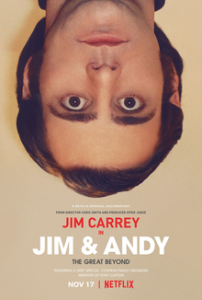 Although I loved Man on the Moon – directed by the great Milos Forman (One Flew Over the Cuckoo’s Nest) – I was more entertained by Carrey’s off-screen antics in Jim & Andy. Carrey truly lived the role to a degree that I believe Kaufman would have appreciated (loved the scenes of Carrey antagonizing Jerry “The King” Lawler just as Kaufman had done years before!). By the way, the original title for the documentary was Jim & Andy: The Great Beyond – Featuring a Very Special, Contractually Obligated Mention of Tony Clifton.